Extraordinary sweet and salty treat. 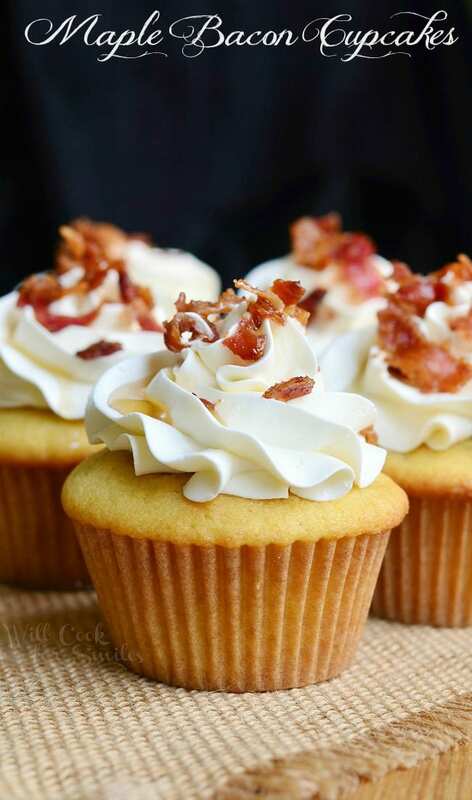 Soft maple cupcakes with a hint of bacon topped with maple buttercream frosting, crispy bacon bits and a touch of maple syrup. Desserts with bacon started sweeping the food scene a few years ago. It was such a craze that people tried adding bacon to just about every sweet treat. Maple/bacon and chocolate/bacon seemed to be the most popular combinations. Although, maple and bacon has been together for a long long time already. I used to see people pour maple syrup over bacon strips all the time when I worked at the Cracker Barrel. I honestly thought it was the strangest thing until one day, curiosity took over and I tried it. Not gonna lie, it was interesting and tasty! It could have been just a southern thing but it was tasty nevertheless. So I can definitely see how maple/bacon desserts became so popular. It’s not just cupcakes that feature that flavor combination, I’ve seen in in doughnuts, muffins, waffles, pancakes and cookies. Maple bacon doughnuts are still on my list to try. They had a sweet, small wedding and everything was fun and non-traditional. 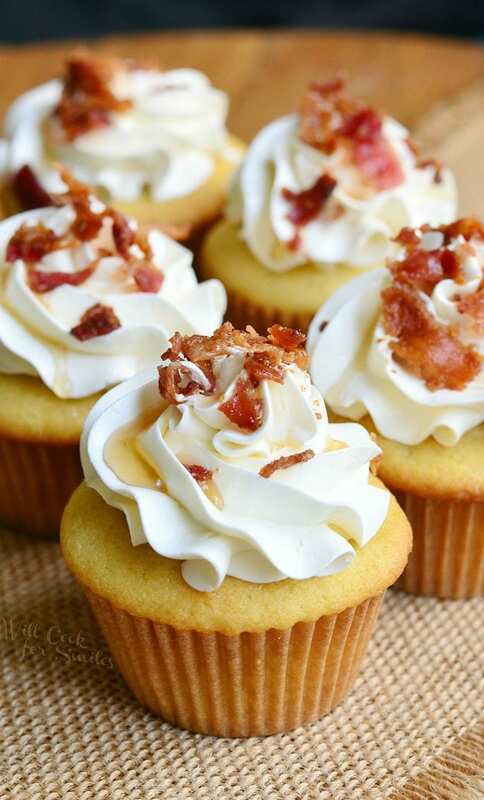 So she wanted some kind of unusual cupcakes and decided on maple-bacon. You know the rules, what the bride wants, the bride gets! So I whipped up like five batches of cupcakes to get three perfect ones for them. By the end, I could make these cupcakes with my eyes closed. I was so nervous to find out how everyone liked them since it was a whole lot of strangers trying my cupcakes. I was very happy to find out the next day that everyone loved them. Very happy! 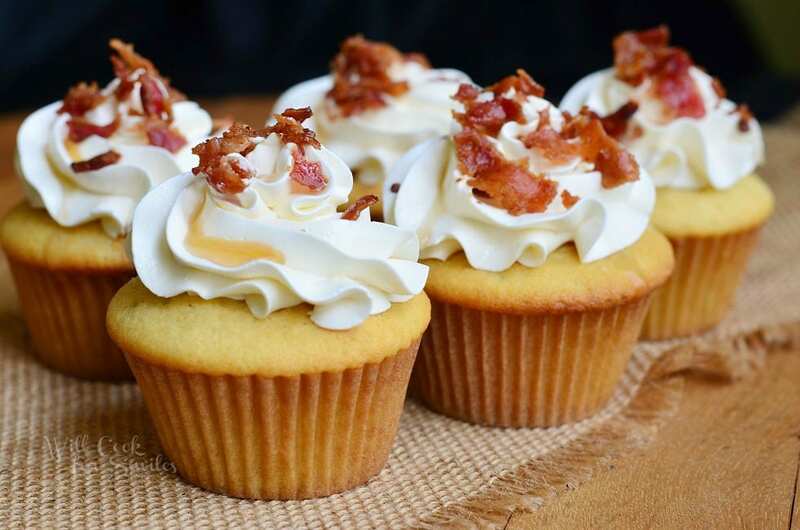 Soft maple cupcakes with a hint of bacon topped with maple buttercream frosting, crispy bacon bits and a touch of maple syrup. Sift flour, baking soda, salt, and baking powder together and set aside. In a bowl of an electric mixer (use paddle attachment), beat egg whites for about 30 seconds and slowly start pouring in sugar. Beat for 2-3 minutes, until white and fluffy. Start pouring in oil mixture, slowly, as the eggs are still beating on medium-high. Lower the speed to low. Alternating, add flour mixture and buttermilk in two parts. Mix until just combined. Scrape sides and bottom of the bowl and low mix a couple more seconds until incorporated. Divide batter among the cupcake cups, filling them about ⅔ of the day. (I recommend using an ice cream scoop so all the cupcakes are even.) 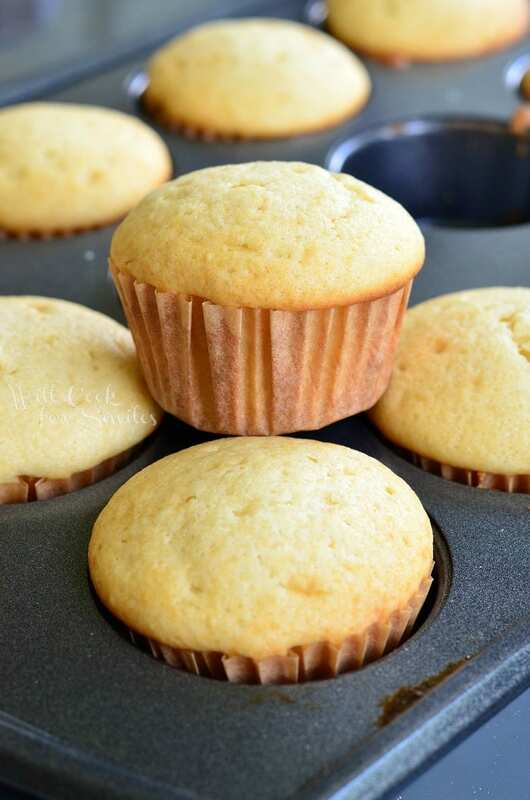 Tap the cupcake pan on the counter a couple of times to help air bubbles come up. Bake for 18-20 minutes.Take out of the oven and let them rest for 5-10 minutes. Gently take the cupcakes out onto the wire rack to cool completely. Drizzle about a teaspoon of maple syrup on to of each cupcake. Beat softened butter in the electric mixer, on medium-high speed, for about 2 minutes. Lower speed to low and carefully mix in powder sugar, salt and maple syrup. Once sugar is incorporated, scrape sides and bottom of the bowl and raise speed to medium. Beat for another 2-3 minutes. Transfer frosting into a piping bag with desired tip attached. Pipe cooled cupcakes. Crumble crispy bacon and divide it on top of piped cupcakes. Drizzle each cupcake with some maple syrup. I LOVE these! They look so beautiful. Seriously I don’t think anything could taste any better than a maple and bacon cupcake. This sweet and salty combination is my favourite kind! These look incredible! I could taste the salty-sweetness in my mouth just looking at your beautiful photos! I am making these for work tomorrow. Do I need to refrigerate them? I’m sorry I didn’t get back to you right away. I would recommend refrigerating if it’s more than just a few hours before serving just to keep them fresh. 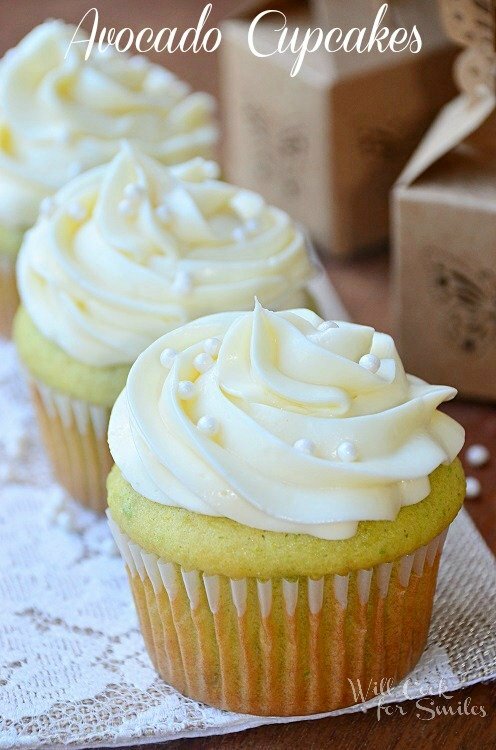 Cover and refrigerate and pull about an hour before serving so the frosting softens. These look so good! Donyou have to wait to put bacon and maple syrup on at the last minute before serving? Must you refrigerate? Do you mean the topping? Do top with maple syrup and bacon otherwise maple syrup will soak the pancakes and make it soggy. You can refrigerate leftover and reheat later, just try not to add syrup to those you’re not serving so they don’t become soggy. Oh goodness, I thought this was for the pancakes!! Lol, never mind the previous reply! If it’s more than a few hours before serving, do refrigerate them. They will stay fresh better. Just pull them out about an hour before serving. You can add bacon and maple syrup on top right away or before serving, that won’t matter much. Please recheck your ingredients. I thought 2 tbsp of baking powder seemed like too much but I followed your recipe anyway. Needed to say, it was a mess – and I had to throw everything away. – how wasteful! At least I can use the cooked bacon and icing butter for a different recipe. The pictures are lovely – too bad mine didn’t work. The previous reviews are correct, 2 tbsp of baking powder ruined these cupcakes. They were a disaster. I had a couple of crazy months due to family matters and the emails got away from me. I should have checked the comments above sooner. It was a mistake in the recipe. I dug up my notebook and in fact, it is 2 tsp of baking powder. I’m sorry about the fail and the mistake! I’m sure you are still known as a great baker! I wish I’d read the reviews before I make I made these. Even after the adjustment was made for the amount of baking powder, they sunk down in the middle and were not very presentable. I was making these for a function for 100 people, and I cannot afford to replace the ingredients. Hopefully the icing will cover the deflated cupcakes. I hope you and everyone enjoys the way they taste! Your cupcakes look beautiful! My best friend loves maple bacon and I was looking for a recipe for a Thanksgiving treat. I’m so sorry about the previous cooks troubles but I would love love love to try this recipe. It’s the most appealing one I have found. This is long overdue. 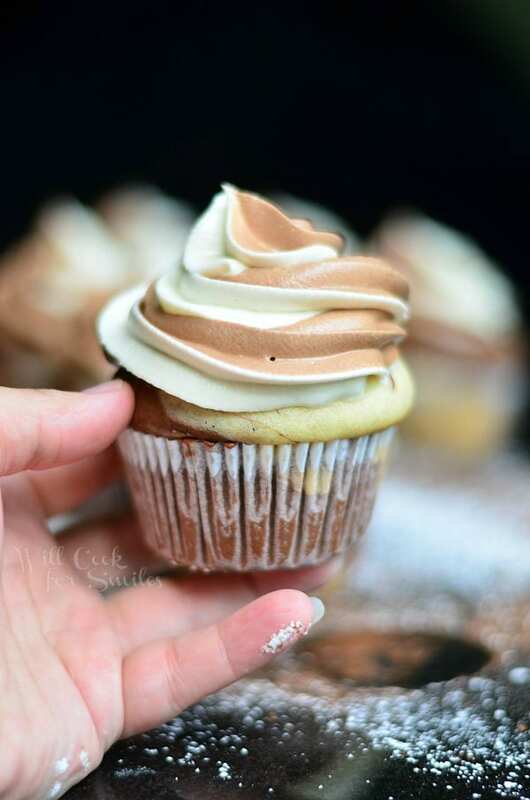 I have a new recipe for these cupcakes and I remade them using a different technique. It hasn’t failed be before and I’ve made this recipe a couple of times for my husbands work. I hope you will try them! Thank you and I”m so sorry for taking so long. why are you re-working the recipe? It seems that quite a few people had a problem with cupcakes deflating. Since it didn’t happen to me when I was making them, I need to figure out if there was an error in somewhere. Have you made them before I took off the recipe, Sarah? Hi I was looking for the recipe and I saw that it was being reworked last year…is is available as yet? This is LONG overdue but I do have a new recipe up. I hope that everyone will forgive me for taking so long to re-work the recipe. I hope you will give them a try too. pps. notwithstanding the earlier comments I would love to try the recipe for you to see whether I have any problems on my end …if you are interested and willing to share it feel free to reach out. Ho there! Actually, I’m very close to a new recipes. I’m planning on testing out one little change this week and then post it. I did come up with an easy version of a recipe too, using a box mix. This sounds like a really yummy recipe and I can’t wait to make it! 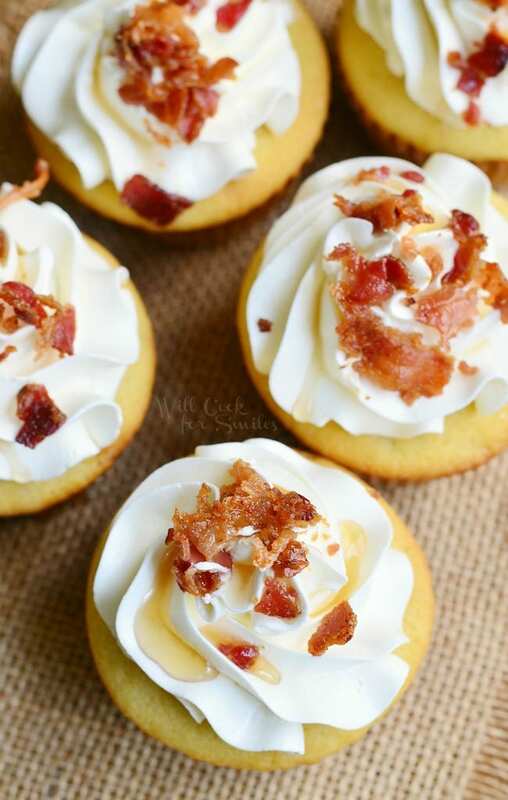 Is the bacon grease absolutely necessary in the cupcake? Thank you, Taylor! The grease adds more flavor, but can be substituted with oil. My 3 granddaughters are in a performing singing group. I am always looking for fantastic new recipes for them. I made a double batch of your marvelous muffins for them when they performed at our church. I have been asked to make more every week. Everyone loved them and they turned out perfect. Thank you and God bless. Oh My! These are my new favorite. 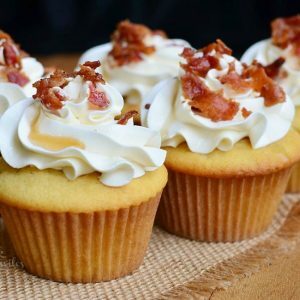 My friend requested bacon cupcakes and I’m soooo glad I found your recipe! It’s a good thing I made them specially for the birthday girl because otherwise I would eat the entire batch myself. Thank you so much!! Now to look through your website for other goodies. We weren’t paying attention and realized that we didn’t use the vanilla extract due to following the recipe it never called for it With a table full of ingredients we neglected to notice it was with the batter ingredients. This looks great! I can’t wait to try them out! I was going to make mini cupcakes. How should I adjust the cooking time/ temp? How many minis do you think this batch will make? Thanks! 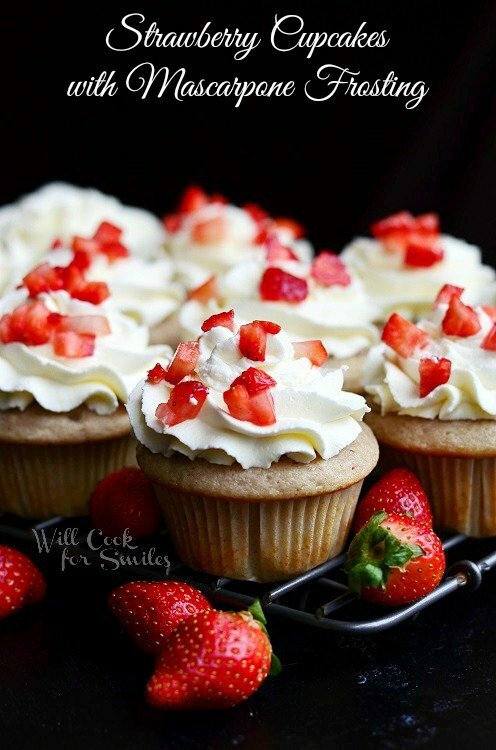 To be honest, I don’t have much experience with making mini cupcakes but after looking around at some mini cupcake recipes, I would estimate this recipe to make about 4 dozen mini cupcakes. 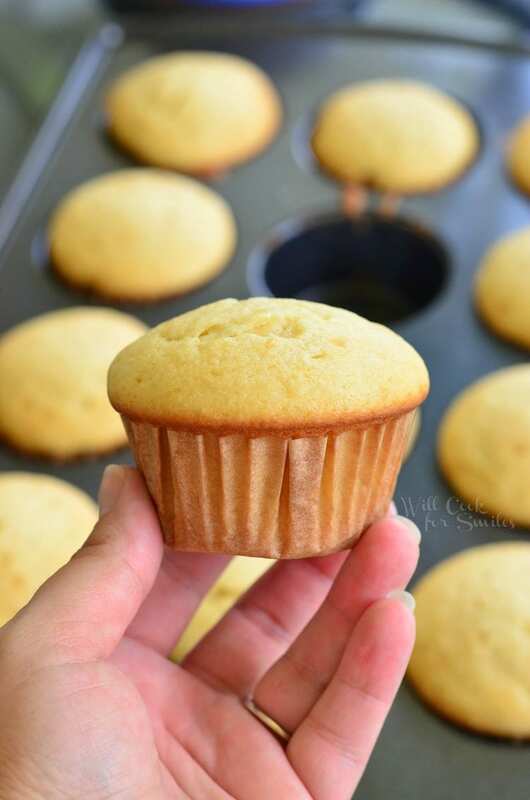 Looks like bake time for mini cupcakes is 11-15 minutes. Lyuba, these turned out amazing! Perfect combination of salty and sweet! The cake itself was not very sweet which I appreciated and the frosting was just enough sweetness. I made mini cupcakes and found that 11-13 minutes did the trick. It made just over 4 doz mini cupcakes and once cooled I added a bit of maple syrup to the top prior to frosting. I baked the bacon so it was really crispy and minced it so each mini got plenty of bacon sprinkles! I didn’t drizzle more syrup on top of the frosting because they were so tiny and I didn’t want them to be sticky. Everyone loved them! They were a huge hit and will certainly be made again! I’m so happy it turned out well, Morgan! I don’t like desserts overly sweet myself so I’m glad you appreciate that 🙂 I’m so glad it was a success! 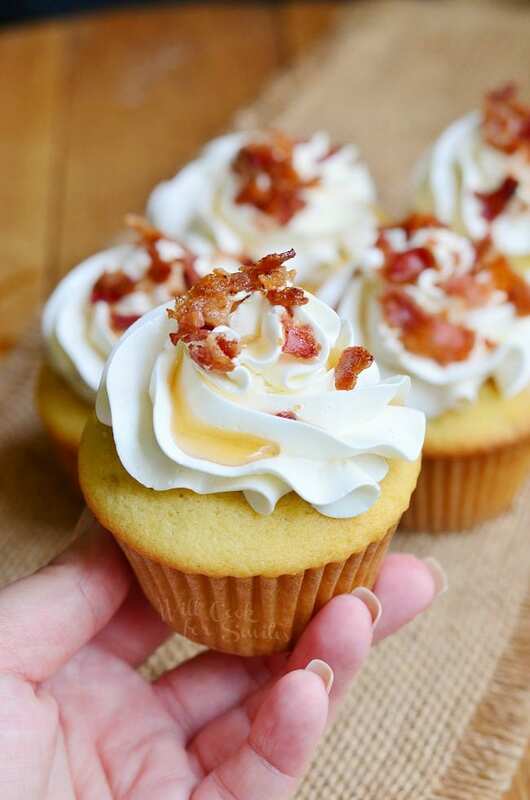 What decorating tip did you use for bacon cupcakes? I am definitely going to try these! They sound delicious! I, too, have a bride that wants a breakfast cupcake. The only difference is she wants minis. I picked 8 different recipes to try. This one was first on the list because I liked the ingredients. I am happy to say I don’t need to try the other recipes! This is delicious. I didn’t think I would like a breakfast cupcake, but I couldn’t stop eating these. It’s like something that would come out of Willy Wonka’s factory or Jane Jetsons food machine. It’s little, but you feel like you are eating a pancake and bacon breakfast!! Thank you sooo much for all the hard work you put into perfecting this recipe. It’s absolutely delicious! Awe, you made me so happy, Tami!! Thank you so much for letting me know and I wish your bride a lifetime of happiness! Question some of the comments say 2 tsp of baking powder but your recipe says 1 tsp, what is the correct amount to use? This recipe has actually been re-worked and updated so some of the comments are old. The recipe itself is updated, so it’s 1 tsp. Hello! Will this work with pure egg whites from a carton? So sorry I didn’t get back to you sooner! The jury is still out of using egg white from a carton in baking and whipping. So brands do work and some do not .Some brands even say right on the carton that it can not be used in meringue or other baking recipes. I can’t say for sure since I haven’t tried a specific brand.